Barriers to quilting, how to make them go away? Thread: Barriers to quilting, how to make them go away? I'm finding that I have many reasons to not sew or quilt lately. First, I'm not retired and likely won't be for another 20+ years, so recreation time is limited already. I don't work full time though, and I work from home. I seem to spend an awful lot of time getting ready to sew, but no real time sewing. Machine is clean, oiled, serviced (as are all of the machines in the house that I use, and then some), I've researched to death (I've read 3 Karen McTavish books in the last 2 weeks - cover to cover), my sewing desk is clean and ready to be messed up, bobbins wound, etc. I just can't get started. Does anyone have any tips on how to overcome some of these barriers? I have been concentrating on practicing FMQ for the last little bit, but I don't find even 10 minutes a day, and so when I come back to it, I have to spend time getting rusty muscles back into the swing of things, and of course those results don't look very good. I wish I had your discipline and order. I think your dh may be right. Not only fear of failure, but also perfectionism, held my quilting back for many years. It's only now that I am ***really*** old that I have realized it's better to make something than to only think about making something. My new mantra is "finished is good" no matter how many mistakes there are. And I have found that the awful mistakes I make along the way seem to disappear in the finished product. If you do not have something already pieced and waiting to be quilted, I would recommend dropping the FMQ practice for now. It's just another way of postponing actually making something. When I get stalled, I get out the kitchen timer and set it for 10 minutes. I need to do whatever my goal is only until the timer goes off. This gets me started. Most times I reset the timer and keep resetting it until I am actually "into" whatever I am doing and no longer want the timer. The first time you do this your goal for the timer could be to look for a project you want to work on. Just remember that you do not need to decide on the project within that 10 minutes; you just have to spend 10 minutes working on it. In my case, I would spend the first 10 minutes going through my plastic boxes of "to do" projects I have already put together. well you could start by making up some "kits"
go through and pick out a pattern, cut up the pieces, write a short note on how you want to quilt it. Then put all of that in a zip lock baggie. Get several kits together. That way when you are ready for a project, you have several ready to go. Can even add the backing too. And your fear of failure isnt involved at all, cause you are just making kits it might also inspire you to make a quilt with the kits But in any case, when you do find your motivation, you have plenty of ready to go projects on hand. I understand totally! I have gotten the equipment, read, read and read some more. I am just terrified of making that first cut. Which logically is totally stupid since I was going to start with a couple patchwork pillows so no big money output on first project...but like you, I just can't seem to set up to make those first cuts. I think DH is almost correct. I have a little of that. Spent the afternoon cleaning drawers to get ready to do something.LOL.. Didn't turn the machine on! I'm gonna put up my sewing machine I'm working on and get busy sewing. I happen to have a DDL who you sound very much like. She is working part time (away from home). She is a quilter, a crocheter and a new knitter. Her discipline is unbelievable and I am envious of her ability to juggle all her "balls". What I have noticed about her is that she keeps her quilt quite organized. By this I mean that after picking out the pattern and fabric, she takes whatever extra time she has and she starts pressing her fabric. Oh! She reads the directions thoroughly and then has a keen sense of what she will need to do. Then she cuts all of her pieces and organizes them. Then she starts sewing and does as much as possible in the time she has. She continues in this manner through the process of putting the pieces together into blocks, then blocks into rows, then rows together, then borders (almost always 3). Then she sews her backing. She puts her batting in the dryer for 10 minutes to just release some of the folds. She uses basting spray and puts her layers together. Then she FMQs. She started out with an FMQ course and used simple patterns and her patterns became more difficult as her skills grew. Then cut off extra pieces. Make binding, sew binding to front and then hand stitched to the back. She does not use labels. (Don't know why.) All of this work for her is done in very small windows of time. It's my belief that her organization skills (which you obviously have) help her to sew and walk away and then return and pick up where she left off. She is very prolific. It just amazes me as I am retired and I cannot keep up with her or do the really neat job she does. There is a pattern out today (which really doesn't need a pattern). I believe it is called "Race Quilt". You use jelly roll strips that are 2 1/2 inches wide. If you Google it you will see many examples. This is the pattern that my 10-year old GD asked me to do for her. Yea! Easy peasy! The pattern that I saw has two stems with flowers appliquéd over the strips. Maybe you should start a small project-like a table topper or wall hanging. The gratification of a finished project will come faster. I also try to find projects with 1 new technique so I am also learning as I am working. I usually set the timer on my phone and work for an hour and then stop. I agree with CarolynMT -- make up fabric kits that are ready to go. If I don't have a specific plan for a quilt and just can't bring myself to cut into "new" yardage, I go straight to my scraps and start throwing them on my Accuquilt Go dies. Making usable sized pieces of fabric out of a giant mess of scraps always motivates me to start putting some together in a pattern of some sort! 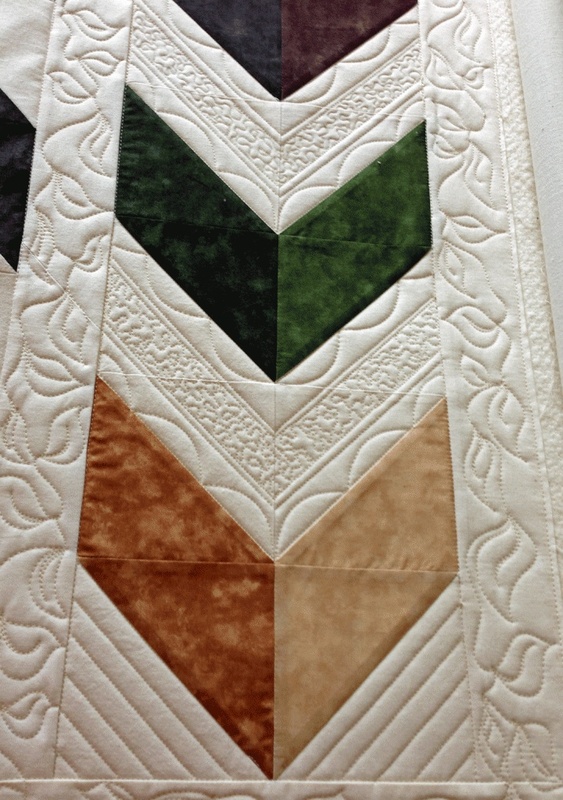 And because they were scraps, they don't have to be perfectly pieced for an award-winning quilt. I'm usually always motivated by sewing something together, no matter what it is. Anything that gets me sitting down & using my sewing machine works because once I start sewing I don't want to stop! I wish we could even each other out! I'm the opposite. My sewing area is always messy, my machines are rarely oiled. I have to set the timer to get up and do work or housework. I set the timer for 15 mins. and do a chore, I set it again for 15 mins and do another chore, then I set it for 15 mins and get to quilt - my reward! On the rare occasion that I do not feel like quilting I look for a quilt show or go to a local quilt shop to get my creative juices going again. I understand what you are saying. I used to be really afraid to start any quilt because I was afraid I wouldn't like it when it was done. I spent too much time agonizing over the pattern, the fabric, you name it. I have only recently begun to realize that the world won't end if I make a quilt that I don't like, and I CAN stop in the middle of a quilt if I know I am never going to like it. I am still working on this. The quilt top I finished two days ago made me so happy because the picture I had on my "mental design wall" matched what I ended up with, and I loved it. So....I started planning my next quilt, experimented with numerous fabrics, none of which went with my focus fabric. Finally I accepted I wasn't going to like anything I was thinking of and made a tote bag out of my focus fabric...a tote bag that I really like. I just read over this, and now I think none of this will help you. Perhaps though, you can realize that "the world won't end" if you make something you don't actually like. Just finish it or put it aside, and go on to something else. Sewing up a kit, as others have suggested, may be just right for you now. Good luck. You will work through this, I just know it. BIG - Discipline and order gets me 30 odd machines in one room, but doesn't seem to be helping me be creative. Prism99 - You're probably right, the FMQ could be a distraction as well. In fact, there's a chance this thread is as well. Check, I've seen a couple of references to timers now. I have been using one to not forget lunch on the stove when I'm home alone, I'm well practiced. I have found that I can spend days looking for a project. So I think I will say no looking for a project, but picking one that I've already researched would be a really good place to start. CarolynMT - You bring up a good point. I wonder if part of why I'm stalled is because I really don't like the cutting phase. I love the design stage ( something you can see when I post about modifying desks and stuff), but the cutting not so much. I don't mind the piecing, but it's the quilting part I like... I'm terrible with a rotary cutter. I know it needs practice like anything else, so maybe this is a good practice for me. barny - it's so easy to "Waste" a day getting prepared, isn't it? littlebitoheaven - holy cow! Your DDL IS impressive. I have a little bit of organizational envy. So far, I haven't run into a jelly roll that spoke to me. I tend to buy yardage for stash. Luckily my "Tastes" don't change much, so I lkely won't get too tired of any of it, and my color preferences mostly go together. Perhaps I will see if I can come up with some fabrics to cut into 2.5" strips, for practice and then for a quick project afterward. In my former corporate career, I was a technical business analyst. One of the things I often told people was "this is not the emergency you're making it out to be. If this system is unavailable for a hour, no one is going to pass away" I worked in health previous to that. That was a situation where unavailability of systems could cause that situation. I think it sounds like I need to embrace what I told people back then. It doesn't have to be perfect, it just "needs" to be done. I do know, fundamentally that quilting is a journey, I won't be great at it at the beginning. Really, I do. nancysp - sitting in the travel trailer last week during the hot spell (it has AC, the house doesn't) made me realise that there are a few things, small ones that could personalize the trailer. I did like that friendship runner that Fons And Porter has in their magazine a few months ago. I should see if I have enough matching fabrics for it. You're right, a small project where I can learn would help a lot. CindyA - I think the reason my machines are the way they are is I came at quilting from a different angle. I started working on the machines first, and hung out strictly in the Vintage and Antique Machine forum, then started poking my head out here. I started quilting because I got tired of the couple of clothing projects I'd tried never fitting like they did on the cover of the envelope. I -never- thought I'd be a quilter. And so far I'm really just a "barely has begun" quilter. We went to our first quilt show a month or so ago. I found it inspiring, if a little intimidating. Sometimes the learning process and doing process takes a little longer. I go through the different books and look at the designs and videos and buy material and do everything but go to the machine or get the cutter out for the pattern. it's hard especially if much of your life you've been led to believe you will never be good enough. I don't do for anyone in particular and I definitely don't do deadlines. Just do a little at a time, different blocks and eventually you will have a sampler. Doesn't have to be big. Maybe put 2-3 blocks (or even one) together. Then take a break. I've had through my life the potential for 4 quilts and all of the material was pitched in the trash mistaken for rags because they were parts of blocks. The time will come when you start up that machine or pick up that needle and thread. maybe just do small projects, like one disappearing 9 patch or D4P. just one. Take a scrap piece of material and just practice your stitching on the machine, doesn't have to be big, practice the 1/4 by trying to eyeball it. See how far you can go with that seam. if nothing else then shut the door and wait for another day. Just make sure you check out the board. There will be something to wake up that sleeping beauty. We will all be here when you wake up out of that funk. DH may be right. It's llike one of those damn phobias that is almost paralyzing. Prayers from the Gulf it won't last long. You need a schedule...if you work from home pick 8 hours and stick to it...but you can sew before you start working. I find I can get a lot done prior to my work day. After work I am tired. Just think you have an extra hour each day not having to drive to work...good luck have fun...life is too short to just work, work, work...I use to be like that until the day I was laid off...I am working back at the same place and glad....but it also taught me a lesson...you are just a body and can get let go at any time...no matter how hard or long you work. Now I work...but also take time for my hobbies. Quilting should be an enjoyment and not a Barrier. It seems that you won't let yourself begin the process cause you know you will not be able to start and finish due to other commitments and that is why everything else is complete ( the pattern, choice of fabrics, machines ready, desk clean, etc.) You know these things will be completed and done (OCD). To start a project the OCD gets in your way so you don't. It's not a bad thing, it's just a thing and you will need to either tell yourself, "so I may not be able to complete it today, or I may not get it all done," but it is started. To comply with yourself , when some of it is started and not able to complete, then neatly put it away for the next day. Even if it's 2 hours a day to work on it, at least you started. But the putting it away neatly and organized will satisfy the part of you that won't. It's the fear of not being able to complete it is what's stopping you. Good Luck to you, hopefully we'll see that quilt, no matter how good or bad it may be. We don't police it here, just support and help. Try signing up for a class or doing a BOM. Sometimes the pressure of needing to get your homework done will help get you started. I'm the opposite of you, I have way too many projects planned and/or started and find the finishing step the hardest. Your quilting is beautiful. Wish I could see the whole quilt. I sometimes have a few days when I feel like I just don't know what it is I want to do. Now for me there is no lack of projects - some UFOs, some WIP, some just rattling around in my head. I may just sit in my sewing room and rearrange my fabric or read this board or check through my list of links to projects that have caught my eye. Next thing I know I've found what I want to do and away I go. I like Prism99's idea of setting a timer..... I do something similar. I'm retired so I can spend all the time I want at my sewing machine but I have lots of things to do. As most retirees say, I don't know how I had the time to work. Anyway, I'm sure you have several things you'd like to make. Maybe you can't decide which one to start. Pick 3 or four and lay them out. Put numbers on them and ask your DH to pick a number, sight unseen. Then, just start on that one..... consider it a practice run. Don't let yourself 'worry' about anything.... this is just for fun... to get you going. I'm confident that once you start, you will be able to keep going... and going.... and going. When you get stuck, call on us to give you a boost..... I enjoy quilting so much that I have to bargain with myself to get the other stuff done.... Good luck and let us know how it's going. I"m not one to advise you or to even give an opinion because I am the most disorganized person there is. In college I had classes on management skills, and also had more of it in other professional areas,but I am still as scatter-brained as can be. It seems I know what to do but just can't seem to do it "the way it's supposed to be done." It sounds as though you are relatively young, since you have twenty more years to work. Well, let me say that as you grow in wisdom, your priorities will change and you will begin to put other things first, or at least fit them into your busy life. Perhaps you need to include your quilting in your "schedule" and treat it as you do your other responsibilities. Going at that pace with not enough recreational distractions (which can include your quilting, etc) can affect your health in the long run. I hope you have many hours of doing the quilting that you love. Other QB members have given you great advice on starting projects. I know once I have a project started, I try to get to it, at least occasionally, if not often. Good luck. Last edited by GailG; 07-08-2013 at 04:35 AM. I don't think you WANT to quilt. I think you like the IDEA of quilting, but you aren't "there" right now. When I don't want to quilt, I love the ideas I come up with for quilts I could make but I spend a lot of time "prepping" to quilt - cleaning the house, making sure my space is cleaned up, and my house is in good shape, and my work is all done, etc yada yada. But when I really want to actually quilt, there is little that will stop me, except for a very messy work space. My studio is in our master bedroom, and I find that in order to feel at my most creative, I can't have a lot of laundry lying around, waiting to be washed or put away. And because my room is multi-purpose, I do my best to keep it mostly clean so when I am ready to quilt or sew, there is no reason why I can't just walk in here and go at it. The thing is, when you really want to do something, you'll make time for it. Yeah, you may be afraid of failure, but if you don't fail, how will you ever improve? I've royally screwed up a quilt I worked on for three years for my husband ... but he doesn't really care, and no one else can see the mistakes when they look at it - not even my mother, who has sewn for 40+ years. There's not a person on this board who doesn't have an "ugly quilt" laying around somewhere that they'd rather no one see, but they learned a lot from making it, you can bet. You have gotten a lot of good suggestions in this thread- some of us have been where you are and some like me, have never been nor will ever be there. I am not very organized. I do however have slumps where I don't feel like quilting. I have so many projects going that I shouldn't feel like that. I like the idea of kits and small projects. My 'go to' no brainer project is string blocks. They are sooo easy, can be made in any size and can be made with scraps or purposely cut strips. They are beautiful and each one is different. Give it a try and see what you think. Pinterest has lots to look at. I have to give myself permission to fail. To do that, I put myself into 'student' mode and try a new 'something' ...technique, tool, project sample, embellishment, surface design, method, whatever... for as long as it doesn't feel so frightenly new and foreign to my hands and eyes. My brain is the last to fall into place, but once my hands and eyes are on board, my brain pretty much has no choice but to go along for the ride. In other words, I stop overthinking it. It can take as little as a few hours or much, much longer. I design my own quilts and often do a prototype in 'student' mode just to figure out how I need to make everything do what I want it to do in the final version. If I started with the idea that it had to be just right the first time, I'd never start...and never starting pretty much guarantees I'd never arrive where I want to go. I don't get hung up on perfection, but I am majorly committed to excellence. There's no way I can deal with 'done is good enough'. By treating each new 'something' as primarily a learning experience, I give myself time to explore without the pressure to excell. As long as I'm gaining ground in some way, it's okay. Once I'm comfortable with it, the committment kicks back in and I'm all set. I learn from everything I create, all of it. Even if I learn NEVER to do that again!